Kenneth Hesketh’s name has been cropping up in the pages of MWI since November 2001, when an interview with the then 33 year old composer appeared. Notwithstanding several concert reviews and a further conversation with Christopher Thomas, it’s only in the last five years that CD reviews have started to appear with any regularity. The most important of these were an orchestral and ensemble disc released by NMC in 2013 (NMCD 186 - review) and a terrific recital of his piano works recorded by Clare Hammond for BIS in 2016 (BIS 2193-SACD - review). While I certainly enjoyed the works on both of those issues, this new release on Paladino contains three brilliantly realised orchestral works which are arguably even more impressive. All have been composed in the last four years and confirm Hesketh as an individual voice with a consistently identifiable style. These performances by the BBC National Orchestra of Wales have been scrupulously prepared and are conducted by the Austrian Christoph-Mathias Mueller who also appeared on the NMC disc. All three items demonstrate Hesketh’s incisive and refined orchestration, and benefit from an outstanding recording. It is a real coup for the Paladino label to have produced this exceptional composer portrait. All three pieces were inspired by extra-musical ideas. The first, Knotted Tongues takes its cue from the Cartesian idea of ‘The Beast Machine’, the notion that the human body comprises a complex web of interdependent mechanisms, each of which may be prone to sudden and unpredictable malfunction which would render the body ‘unreliable’. The title is here specifically suggestive of the breakdown of verbal communication in the form of stammering. As it happens one of my oldest and closest friends has had to endure this condition since childhood, and has regularly discussed its impact with me, not least because he has had to deal with it on a more or less daily basis en route to a professional role which involves a good deal of public speaking. The title of Hesketh’s piece alludes to the author Benson Bobrick’s characterisation of sufferers’ fear of stammering as “the anticipation of the glottal catastrophe”, a description which my friend would certainly recognise and one that certainly helps in grasping this music. It begins with a visceral orchestral ‘splutter’, followed by bass-clarinet and tentative wind-chords which lead to a sudden and shattering orchestral climax which truly comes from nowhere, and dramatically affects the subsequent texture and flow of the piece. To my ears Knotted Tongues is an assured orchestral representation of human tentativeness and vulnerability. Shards of flute melody, pizzicato and sul ponticello string effects and Birtwistle-like tappings are deployed effectively to evoke a real sense of unease. Harp and tuned percussion sounds hint at a state of calm that seems just out of reach. The climaxes that occur as the work proceeds threaten to overwhelm but never quite reach the level of disorder rendered by the initial climax, a compositional strategy that conveys a nagging fear that never quite mutates into terror. One feels the orchestral body straining, vainly, to ‘let it all out’. Knotted Tongues is a thrilling orchestral showpiece which challenges performers and listeners alike. Hesketh’s arrangement of the material embodies diamantine clarity – a quality which defines this invigorating performance, while the recording seems ideal. The concept of time is central to both of the other works. In Of Time and Disillusionment Hesketh makes use of a smaller orchestra, shorn of low brass and much of the percussion which featured prominently in Knotted Tongues. In his succinct note, the composer makes plain that he is (uncharacteristically) aiming for a ‘lighter’ sound in a five-movement structure where two brief, swift panels precede and follow a more extended tripartite central section. The textures and gestures in both opening movements hint at agitation and restlessness; busy woodwinds are succeeded by chugging, skittering strings in the first, while the almost jaunty writing for bassoons in the second is most imaginative and unusual. The third section is entitled ‘Notturni per i defunti’ and immediately projects a crepuscular, ‘nachtmusik’-type aura. Much of this boils down to Hesketh’s imaginative writing for flute and harp; throughout the whole disc one is consistently impressed by his seemingly limitless imagination as an orchestrator. At 4:08 the reference to time is made more explicit by the tolling of a tubular bell – an allusion presumably to the Petite Sonnerie which Hesketh mentions in the note. In both final movements the music becomes more assertive and even approaches aggressiveness; the fourth movement also features yet more attractively quirky writing for bassoon. In ictu oculi (in the blink of an eye) completes the disc and restores the full orchestra, although the work was originally written for the National Youth Wind Ensemble of Great Britain and has been revamped especially for this recording. The piece consists of ‘Three Meditations’ in which Hesketh muses on the transience of time and the finality of all phenomena. These three panels merge into each other. In ictu oculi opens with a mysterious cloud of wind and percussion which in turn gives way to muted brass figures, and rocking, clicking gestures. Woodwind solos feature prominently, notably for flutes and saxophones. Hesketh alludes to the idea of a labyrinthine journey in attempting to describe the piece, and if the outer ‘meditations’ are characterised by intricate solo writing, to my ears the central section conveys something of the processional, where the regular ‘thuds’ of brass and timpani act as sonic ‘landmarks’ against which listeners can focus and find their bearings. The quiet saxophone lines concealed in the orchestral fabric seem to convey the tang of be-bop. The final meditation seems particularly inward and rather fragile, and while clouds of pent-up tension threaten to inundate the texture, they never really come to pass. As the piece subsides towards its enigmatic conclusion Hesketh creates some telling portamenti and glissandi effects. It ends with a palpable ‘shiver’ in the strings. Although the benign influence of Harrison Birtwistle seems to hover over some of this material, for example in its fascination with the nature of time or in the ‘processional’ character of the central meditation of In ictu oculi ,the DNA of Kenneth Hesketh’s individual style is unmistakeably evident throughout all three works. While his music is undoubtedly challenging, it has a smooth underbelly, and at its heart is real lucidity and a terrific appreciation of colour and timbre. To provide a rather clumsy analogy, one might suggest that it occupies a hypothetical middle ground between Birtwistle and Hesketh’s fellow ‘Scouser’ John McCabe. 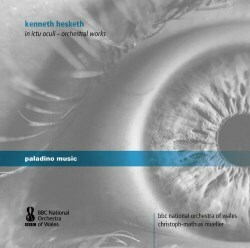 It is quite impossible to imagine better advocacy for any of these pieces than that provided by Christoph-Mathias Mueller and the BBC National Orchestra of Wales – on the basis of this and the previous NMC disc Mueller demonstrates genuine empathy with Hesketh’s style and his expressive goals, while the orchestral playing is superlative. Paladino’s warm yet richly detailed recording hardly be bettered. It sets the seal on a hugely rewarding disc.